Early French nautical chart of the East Indies, including Singapore, based upon the work of Horsburgh. Carte des Iles Sumatra, Java et Borneo et des mers Environnates. An uncommon and impressive 1848 French Depot-General de la Marine nautical chart or maritime map of the east Indies. 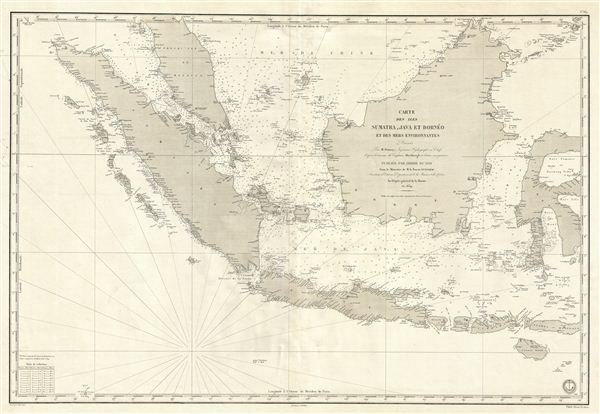 Based upon the earlier work of the British hydrographer James Horsburgh, this map covers Sumatra, Java, and Borneo in full, as well as Malay (Malacca) south of Lancava and parts of the Celebes. It further specifically includes the islands of Singapore, Bali, Lombok, Krakatoa, and Komodo. The Depot originally issued this map in 1839, the present example having been updated by subsequent surveys and corrections to 1848. This map is extremely scarce. James Horsburgh (September 28, 1762 – May 14, 1836) was a Scottish hydrographer and navigator active in the late 18th and early 19th century. Horsburgh was born in Fife, Elie, Scotland, to a humble family. Like many young Scottish men of little means, Horsburgh was destined for a sea-faring life and at just 16 signed on as a cabin boy in a coal trading ship. After many misadventures, including a brief incarceration by the French at Dunkirk, Horsburgh made his way to the West Indies and eventually to Calcutta, India. As the center for British maritime trade in the region, Horsburgh had no difficulty finding work with the British East India Company who maintained an active trade network between India and China. Despite the active trade, one these voyages to China, aboard the ironically named Atlas, taught Horsburgh just how poorly the East Indies were charted. The 1786 shipwreck of the Atlas, on which he was the First Mate, near Diego Garcia Island proved a pivotal moment Horsburgh's life. He subsequently devoted himself to accurately charting the Indian Ocean and the dangerous Straits of Malacca, Sunda, and Singapore. Many of Horsburgh charts are the direct results of his own unique survey work on board the Carron and later as captain of the Anna. Horsburgh's work culminated in the publication if his 1809 Directions for Sailing to and from the East Indies, China, New Holland, Cape of Good Hope, and the Interjacent Ports, a monumentally important guide to navigating the waters if the Indian Ocean and the East Indies. His work earned him friendships in London's highest naval and scientific circles, among them Joseph Banks and Alexander Dalrymple. He became a member of the Royal Society in 1806, when he retired from active sailing. When Alexander Dalrymple died in 1810, Horsburgh was appointed to the prestigious position of Hydrographer to the British East India Company where he worked until his death in 1836. Whereas Dalrymple was somewhat indiscriminate regarding the charts he published, Horsburgh was exacting and double checked the veracity of each and every chart that passed through his office. Horsburgh's work with the East India Company elevated the standards of the Hydrographic Department and earned him a Fellowship with the Royal Society. Today's Horsburgh's accomplishments are memorialized by the Horsburgh Lighthouse, near Singapore, and Horsburgh Island. When Horsburgh died most of his work was passed by his children to the Admiralty, which continued to publish updates until roughly 1864. Very good. A working nautical chart, some pencil marks and soiling related to navigational use. Original centerfold.